Posted November 14th, 2013 by Ryan & filed under Coding. Thanks to Pygame, there’s a quick and easy method to get the dimensions of an image. You just have to load it into a Surface and use the Surface methods get_height() and get_width(). Posted November 11th, 2013 by Ryan & filed under Coding. Some games, I’m thinking tower defense, need to give the player the ability to drag symbols around. But you don’t always want to give the player free reign to drag it anywhere. Maybe you want them to only be able to position symbols in a grid. That’s what we’ll create here using ActionScript 3. This is what we’re going to be creating. Try dragging the green square. It will snap so that it’s always in one of the grid squares. Posted November 7th, 2013 by Ryan & filed under Coding. Earlier this week I Googled for how to find the dimensions of an image using Java, and most of the solutions were way more complicated than they needed to be. Most of what I came across was code that opened the image and parsed through the binary code to get the dimensions. Yes, there’s an easier way. The BufferedImage class has a couple built in methods that will get the dimensions without much trouble at all thanks to the getHeight and getWidth methods. Posted November 4th, 2013 by Ryan & filed under Coding. Want to create a random color in Java? With a bit of math, plus Math.random(), it’s pretty easy. Colors on the computer are made up of a red, green, blue triplet; typically called RGB. And each of the 3 pieces can be in the range from 0 to 255. Java also allows us to create a color using floats for the values in the range of 0.0 to 1.0, or from 0% to 100% of that color. We’re going to use the floats. As an example, pure red will have an R value of 1.0, a G value of 0.0, and a B value of 0.0. Posted October 25th, 2013 by Ryan & filed under Computers & Internet. Came across a handy little tip this afternoon. I’ve only recently put images into my signature in Outlook and noticed that most of the time the images weren’t included in replies. Turns out when someone sends a message in plain text Outlook defaults to replying in plain text. It’s easy enough to change the format to HTML, but the plain text version of the signature was sticking. The tip I came across today was that, once you switch the format to HTML, you can just right click on the plain text version of the signature and pick the right one. Posted October 16th, 2013 by Ryan & filed under Coding. Up until about a week ago my normal process for testing PHP code that sends email was to run sendmail through WAMP and send to my email address. I’m thinking about the amount of time I could have saved had I found this plugin when I first started. 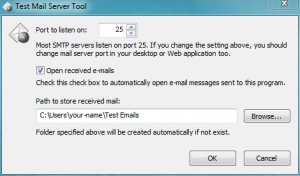 The Test Mail Server Tool runs on your computer and listens on port 25 for outgoing emails, just like sendmail would. Difference is that instead of sending the email out it just saves it to a folder on your computer. So with your PHP sending out mail messages on port 25 Test Mail Server picks it up, dumps the entire message into a mail file, and optionally opens it up for you. On my notebook they’ll open up in Thunderbird and look almost like a standard email. Only flaw I’ve come across is that images don’t show, and Thunderbird doesn’t give the normal option of viewing images. Could be that the images are coming off of localhost though. Haven’t tried it pulling images from anywhere else. Posted September 26th, 2013 by Ryan & filed under Programming, WordPress. Working on moving my WordPress plugins off of this site onto a site of their own. Just moved the Meta Shortcode plugin. Posted August 25th, 2013 by Ryan & filed under WordPress. It’s moved homes as well. My plugins are going to move back to Reliti.com. And I don’t plan on taking the old version off the WordPress plugin site, but I also don’t plan to update that version either. Updates will be done to the version at Reliti. Posted February 15th, 2013 by Ryan & filed under Random. Sometimes there just isn’t time to get to all the cool stuff that comes through Twitter. So I’ve pasted a few below so you can go out and read up. All US networks are hackable. Clocks at Grand Central are all set wrong, on purpose.